As previous posts attest, I am an atheist. One who also rejects Spirituality. However, in some of my talks I have received flak for seeming to defend organised religion (while attacking disorganised religions). I am not sure I do so that much – but I do feel that some of the more positive fallouts of organised religion are absent in the new-age and mind-body-spirit worlds. That is true. I think I may have found someone who almost agrees with me..
By this – I don’t mean Alain de Botton. I am resisting saying anything on the blog about Alain de Botton and his Religion for Atheists.. Partly because I was always taught “If you’ve got nothing nice to say, don’t say anything.” So I won’t. For now. 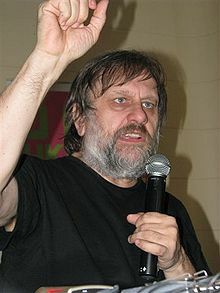 W hat I want to look at is someone who seems to divide opinion even more starkly than de Botton: Slavoj Žižek. 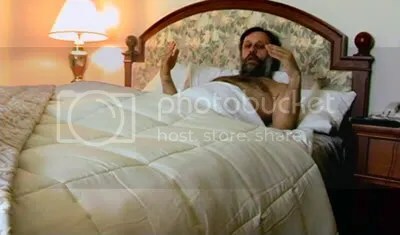 There seems to be a backlash against Žižek at the moment. One writer seems to even call him Buddhaphobic. Perhaps I’ll return to that in another post. Either way he seems to be a love or hate thinker. Personally I’m in the former camp. I can forgive him the endless self-plagiarism (whole chunks from previous books appear in other ones), the digressions, manic presentation style, the sweat and the lapses in Lacanian jargon. Why? Because he is so often very persuasive – and entertaining – and has things to say which actually seem important. But the message that the Gospel sends is precisely the radical abandonment of this idea of some kind of natural balance; the idea of Gospels and the part of sins is that freedom is zero. We begin from the zero point, which is at least originally the point of radical equality. Look at what St. Paul is writing and the metaphors he used. It is messianic, the end of time, differences are suspended. It’s a totally different world whose formal structure is that of radical revolution. What I noted here in the first section was his suspicion of these alternative spiritualities. He seems to see in them a certain self-serving, trendy smugness. And for those in the Christian tradition, it is only fashionable of you find an oppressed discourse of gnostic/mystical rebelliion which grants you some type of victim status. This seems to accord with the way I claim mysticism is deployed by many in the New-age and Gnostic movements. What he does see as worth saving in the Christian tradition is not nice buildings, or moving songs (sorry, couldn’t resist the de Botton dig) – but some thing much more important. That is, Paul as the source for thinking about what radical equality might actually mean: an upsetting of natural orders, of hierarchies, and not of a futile gesture in the face of a society you ultimately capitulate to (as we might characterise the ‘alternative-ness’ of most alternative spirituality) – but of revolution. This doesn’t make me want to be a Christian, but it makes me think that we (atheists) might have something to learn about just how socio-politically radical a set of ideas can be found in much religious thinking: and how we might yet need some of them in the face of the inclusivist, neo-liberal, post-ideological world-views that new-age spirituality seems to represent. As promised, I wanted to make some comments about Julian Baggini‘s article in the Guardian, his Heathen Manifesto. He starts with what atheists call themselves. There has been much discussion around this. Some feel ‘atheist’ is too negative – too much “not-one-of-those”. So perhaps ‘humanist’. Humanism often has noble intentions, but regularly appears as a parody of religious groups. I go on to say more – but the term seems rather aged and locked into a liberal, institutional political setting in our culture that means it only appeals to some atheists, and really repels others. That won’t do then. We have ‘brights’ for atheists. Calling those who reject the supernatural and the theistic ‘brights’ is fairly new, but already seems in decline. Despite Daniel Dennett’s claim that ‘bright’ doesn’t imply that the religious person is ‘dim’ – most seem to read it that way, and I would be surprised to see the term last another decade in common use. So – Baggini is right in that stage may be set for a new term. So he opens the manifesto with: 1. Why We are Heathens. Heathen historically has referred to believers. Whether it be historical pagans of various sorts, or some damn variety of neo-pagan reconstructionists, they have been believers. Often in many Gods, or Godessess, or in some kind of nature-focused monistic pantheism. But they clearly where/are not unbelievers. The other objection is that term is often used in a derogatory manner, as a (not very strong) insult against the ungodly. It certainly has a pejorative tone. Those making objection 1 have a point, but it is not that fatal. Words change their meaning over time – and I am sure Baggini knows the problem, but thinks the benefits derived, and common usage as time goes on, will deal with its legacy-meanings. While I am still unconvinced by the actual term – the first point here is telling. Atheists are often portrayed (and I don’t intend, here, to get into the details of whether there is any basis for that portrayal) as over-earnest, smug, humourless and arrogant. This term demonstrates humour, and humility. Two substantial virtues. I was rather surprised that so many rushed to point out that the term was offensive and abusive -when that was actually (at least in large part) the actual point of selecting it. So I will not be using the term, I dislike the register and also think it sounds way too close to all those mind/body/spirit things that I’d like to disassociate from atheism. However, I think he is well justified in looking for a better term here. Just for the record, I like his principles 3, 5 (a bit), 7, and 10 (only a little, but yes).